Help Ebrima Bah Get His Master's Degree !! Ebrima M. Bah is a remarkable young man. He has always been the hardest-working and most talented student in any school he has attended. Despite being from a poor family in the rural village of Yallal, a small Fula village just north of Illiassa, The Gambia, he has found a way to graduate in the top of his class from Farafeni Senior Secondary School, then University of The Gambia, and to win a competitive scholarship to spend a semester abroad studying in the Czech Republic. 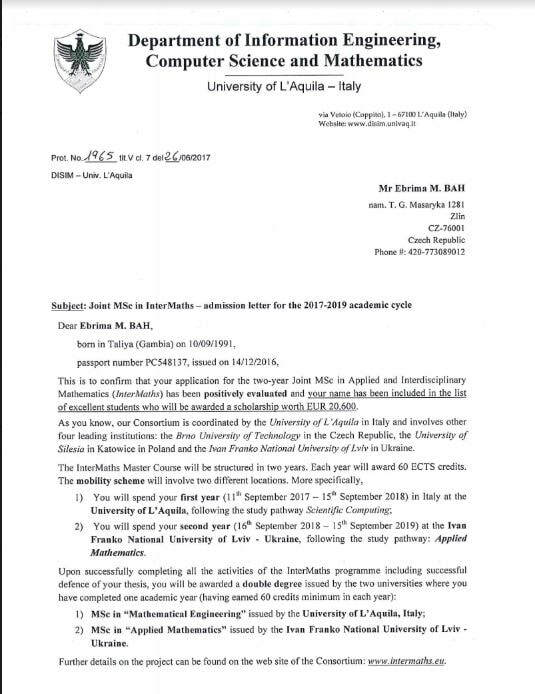 Now he has a been awarded a nearly-full scholarship to the Intermaths MSc Programme in Applied and Interdisciplinary Mathematics between the University of L'Aquila and the University of Silesia in Katowice. But without a little support, he may not be able to take advantage of this opportunity. Already, Ebrima has missed one such opportunity, to study Computational Life Science at Jacobs University in Germany. He lost a 20,000 Euro scholarship in May because he did not have (and GambiaRising could not raise) the 5,000 Euros he still needed. This time, the shortfall is less: the last 500 Euros of a 1200 Euro administrative fee, plane fare from The Gambia, and various living permits, fees, and incidental expenses. All these are so low compared to the opportunity, but out of reach for a rural Gambian family. Since August, GambiaRising has paid the 500 Euros fee, Ebrima's family has borrowed the money to pay his plane fare, and he now needs only the funds for living permits, and the necessities of life beyond the room and board provided by the university. 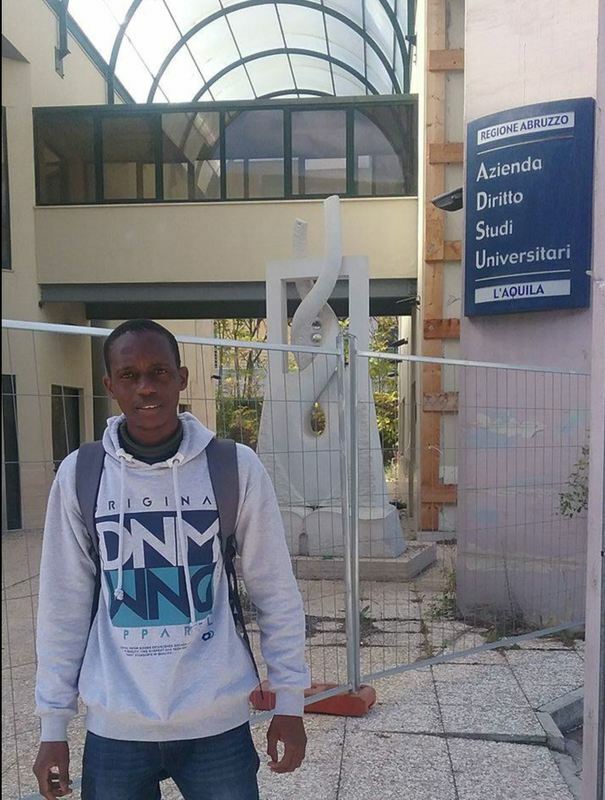 We would like to create a fund of a minimum of $700 (which is 50 Euros per month), to start Ebrima on his way. What he really needs is 200 Euros per month - he's got a dorm room as part of his scholarship, but not food. In an ideal world, we'd also pay off the loan of $420 that the family took out to buy his plane ticket. (Ebrima's father is on dialysis, and the costs of his regular treatments have eaten up all of their savings.) If a small group of us each do what we can, we can give this young man the opportunity that he richly deserves. It's easy to do. Click the Donate button below and choose any amount you wish. All donations are tax-deductible, and 100% of your donation will be used to help Ebrima. I have known of 'gambiarising' through a long term but returned Peace-Corp friend, who was in rural Gambia, for two years and got back home in 2008, I was a close friend of her, though I was just in junior school, and heading for high school. All my school life has been in the rural community, North Bank Region. As a youngster, I had the eagerness and the interest to study in the greater Banjul area, where I believe they have better educations system, but due to difficulties financially, I could not make that dream. Also I used to help my family, as they depend entirely on farming, so leaving them, and move to the Kombo, was not supported, as I used to work on the farms after school and during weekends. Despite having my education in the hinterland, I was still trying to match my peers in the urban schools, especially when they would come to the village on holiday., I used to challenge them academically to merge my level. This eagerness continued to grow and when I went to the senior school, at Farafenni Senior Secondary School, (FSSS). I traveled to Kombo to seek a transfer, but there was no proper guide and support. I continued in FSSS, where I was enrolled in the science program. I choose science, as I have been in love with it, since I was younger. One of the other reasons I was passionate about science, was because, none of my sisters or brothers studied it earlier, and I used to hear them say, "Science is difficult" so, as a young imagining boy, I wanted to know why it is hard - I just wanted to see by myself, and I wanted to prove them, and I did. None of them wanted me to study it, but my father agreed. and the principal, and also, I had good results from the junior secondary school, so I was enrolled in science department, which made me able to catch my number one (1) dream! I spent three years at FSSS, and I graduated in 2011, obtaining the best results in the whole school, with the following subjects: Mathematics, English, Physics, Chemistry, Biology, Geography, Agriculture, General science and Further Mathematics. (Physics and Mathematics were my best subjects.) I enrolled at the university of the Gambia,(UTG) to pursue a Bachelor's program in Physics and Mathematics, in late 2012, after wasting a year, because I could not get the funds to study, and there was no scholarship. But finally, I got some support for studies, and while I was in the university, I was loved by lecturers, and I continued the hard work. Upon my final semester, June, 2016, I was lucky to represent the UTG on an exchange program in the Czech Republic, through a sister University. Ever since, and after meeting my peers from different parts of the world, I felt very motivated, and my studies here were ranked top! as I have been doing great since I have been here. The same motive, grows, as I have been admitted to a prestigious Master's program in Computational Life Science, at Jacobs University, Germany. The acceptance goes with a partial scholarships award, as mentioned on the attachments. This is a great program, that could lead me for a journey in medical science, which I have been thinking off as a career, "Medical Physics", as the Gambia, is yet struggling with medical health, due to the poor medical facilities, I felt, this career path could help for awareness and motivate fellows, more so save lives in the future, as its my honor to go back and impact in the communities of the Gambians. I humbly writes to express my need of support to cover up the remaining and accommodations,This is a golden opportunity that, I would like to capitalize on. "According to the U-Multirank rankings, Jacobs University is among the best five universities in Germany in the areas of research, knowledge transfer, degree courses as well as teaching, internationalization and regional engagement".